Salisbury, MD - Former Delmarva Shorebirds third baseman, Jonathan Schoop, was recalled by the Baltimore Orioles on Tuesday. When he appears for the Orioles, it will be his major league debut. 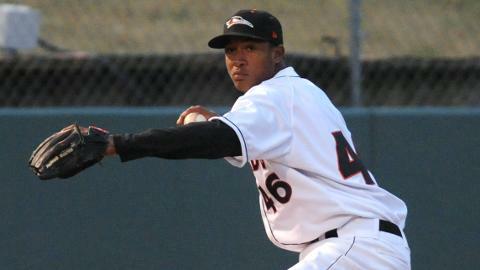 Schoop played for the Shorebirds back in 2011. He was the fourth rated Orioles prospect heading into the 2013 season according to mlb.com. Schoop, 21, batted .256 in 70 games for the Norfolk Tides (AAA) this season. He hit nine home runs and knocked in 34 runs. In 2011, Schoop batted .316 in 51 games played for the Shorebirds. He hit eight home runs and drove in 34. When Schoop makes his MLB debut, he will be the 79th former Shorebirds player to play in the major leagues. The 2014 Shorebirds season kicks off on August 3rd in Asheville, North Carolina. The home opener is scheduled for August 10. For season tickets, contact the Shorebirds at 410-219-3112.